Made from high quality stainless steel with rubber non-slip grip. Get maximum holding pressure with minimal risk of damage to the reptile being handled with the broad-jaws snake tongs. Serrated / Zigzag Jaw reduces snake's ability of forward motion and does not hurt the snake. High quality professional snake catcher tongs, rattlesnake catcher & grabber, can also be used as a tool for key pick up, kitchen shelves, fishing, litter picker, and arm reach extender. 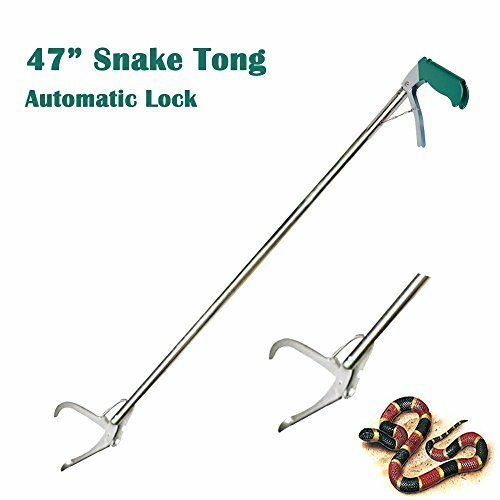 47 inch is a professional length for a snake grabber, it's long enough for safety catching and handling snakes confidently. Ensures you keep a safe distance away to mange it. Larger and bolder spring, non-slip handle for durable use. Please note that you need to pull both ends of the screw forward, the catcher will go to "lock status". Unlike other sharp jaw of the snake tongs that is awkward to handle and easy to hurt the snakes, KONKY's spring-loaded wid jaw for precise pressure no harm to snake, also works on small snakes. Aircraft grade stainless steel tubing material and silver polished finish makes it work smoothly and easily. If you have any questions about this product by KONKY, contact us by completing and submitting the form below. If you are looking for a specif part number, please include it with your message.